The May/June issue of Lonny Magazine went live this week. As usually Lonny did not disappoint. 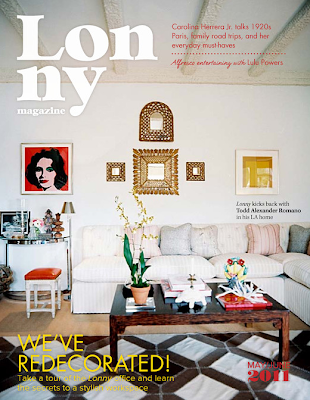 This issue has some tours of some very eclectic homes of designers, writers, and boutique owners as well as a fabulous city shopping guide (what we all loved in Domino) of New Orleans. In case you don't have time to look through the magazine yourself, here is a look a the children's rooms featured in this issue. 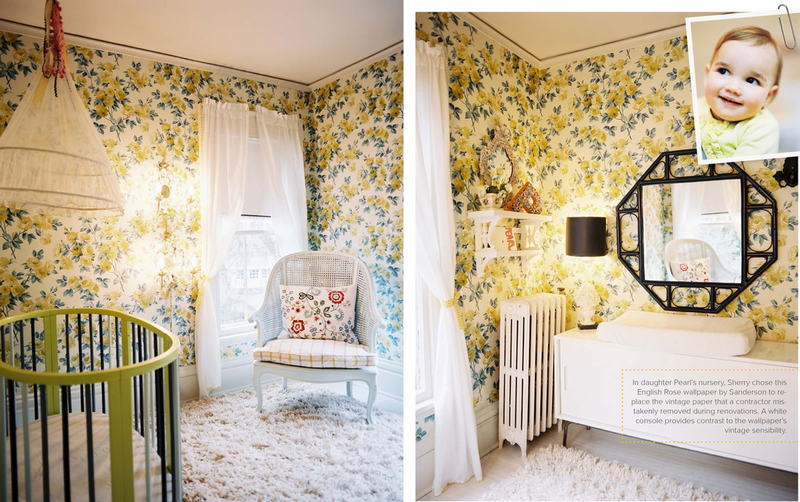 Since the ceiling had awkward lines, the designer Angie Hranowsky used wallpaper from floor to ceiling in her daughter's bedroom. 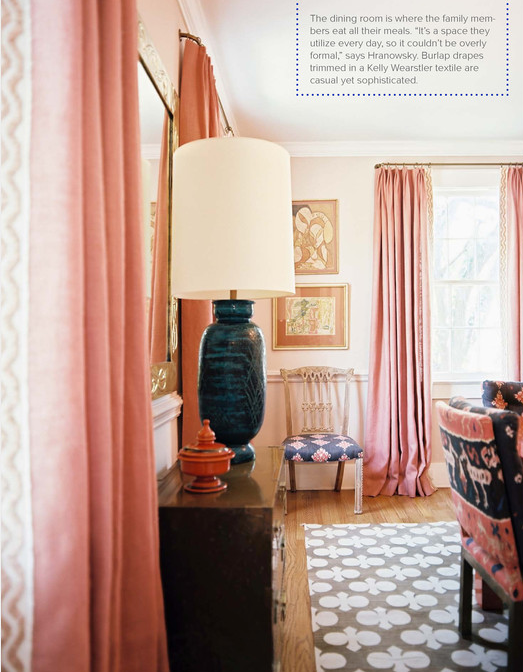 The rest of her home is a wonderful play of patterns, colors and textures. I have admired her designs for a while now. I wish I had her go-to list before I visited Charleston last weekend! I'm really drawn to the color combination in her living room below. Director Lisa Sherry has a playful and whimsical vintage feel in her daughter Pearl's nursery. She is definitely not afraid of wallpaper either. 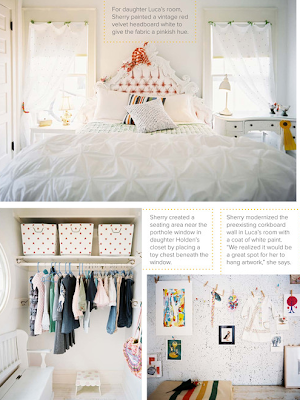 I like the airy vintage feeling of her daughter Luca's room much more. The built-in bookshelf and activity area in this playroom is perfect! I'm dying to use the Smarties rug from The Rug Company used above in someone's toddler room! Caroline Robert, the owner of the home boutique Perch in New Orleans, designed her two year old son's room to be peaceful and sweet. A sophisticated and interesting room for a two year old. 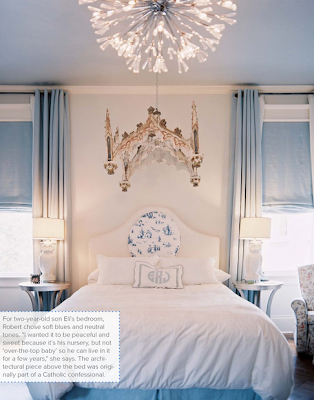 Although it is very pretty, I would naturally see it more as a guest room or even a girl's room first. Love the orange and pink wallpaper with the zebra rug...really don't get the last one as a boy's room though...?! I think you got it all here. I can see that all wallpapers do have their different touch and designs. All great! The amount of a replica watch is far breitling replica beneath than that of the absolute one and this is one acumen why humans go in for a replica watch.However,one should be alert afore they absorb their harder becoming money on a replica watch,There are even fakes accessible of replica watch and these watches are abasement the acceptability of tag heuer replica 18-carat replica watch.In actuality you can buy altered Replica Watch for anniversary day of the week.Do not anguish about the body of the replica watch.The amount of the replica watch ability be low,but they accept got top superior mechanism.In actuality some of the top ambit replica watch antecedent the movement and hublot replica added locations from Switzerland.One is assured that this replica watch will accord one acceptable time and superior service.Afore you buy a replica watch,analysis added sites that advertise replica watch.If you are advantageous abundant you ability get the aforementioned replica watch for a lower amount elsewhere.A replica watch is gucci replica a replica watch and a replica watch can never alter the original.If you are aggravating to atom handbags replica on added people,there are added clues we can attending for.Checking to see what affectionate of characterization the bag has is a acceptable way to be able to acquaint ifit is a fraud.Accurate artist handbags about accept the artist characterization on the inside.Right forth with the characterization is the tag advertence area it was made.Most artist accoutrements are fabricated in Italy or France.